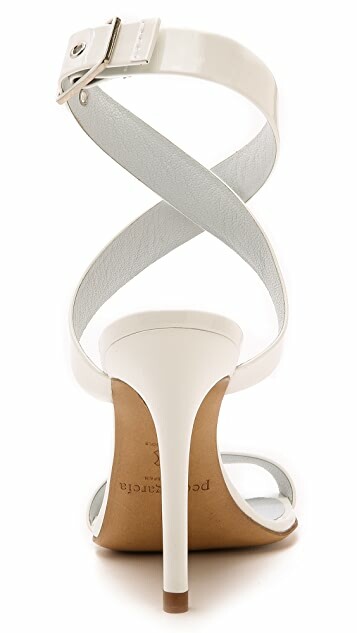 Pedro Garcia sandals composed of slick patent leather. A polished buckle secures the wraparound ankle strap. Leather sole. Shoe label Pedro Garcia is built on a foundation of exquisite quality and painstaking craftsmanship, drawing knowledge from three generations in the footwear business. Grounded, but driven by a love of design, Pedro Garcia footwear offers striking juxtapositions in every pair, creating refined silhouettes with deliberately rough-hewn finishes. Glamorous details give Pedro Garcia shoes an eclectic, sophisticated edge that has become the brand’s trademark. Manufactured exclusively in Elda, Spain, Pedro Garcia aims for positive, ethical production and has a strong commitment to the local environment. These are very well crafted indeed. Unfortunately, the designer missed the mark when it came to the toe box strap. I love wearing pretty sandals to compliment my fresh pedi. My toes were so uncomfortable, squished on the sides because the strap does not give even a tad bit. I wear a perfect 8US or 8.5EURO and my toes are slender and narrow. I love the color which is a cross between a soft pink and salmon. This could not be a better summer sandal for sure. I'm debating on returning because of the tightness. If you have very very slim toes and extremely narrow foot, get them before they're gone. A little tight in the toe area but aside from that a wonderfully beautiful summer sandal.